Spa Francorchamps is a track with a very unique set of demands: top speed for the long Kemmel straight and the run through Blanchimont, whilst maximising grip in the high-speed middle sector. It’s a tricky balance – year after year we see teams bring multiple packages to this event to find the perfect tradeoff. 2015 is no different, and there were plenty of items to look at across the Belgian grand prix weekend. This week’s Tech Highlights covers Mercedes’ impressive-looking rear wing, Ferrari’s low downforce package and McLaren-Honda’s continual woes (despite a power unit upgrade) amongst plenty of other tech news as the second half of the season kicks off. Chassis changes have been progressive on the W06 since China (after their aggressive front wing design was introduced), so it was a pleasant surprise to see Mercedes bring two brand new rear wings to Belgium. Both rear wings had a clear underlying concept – the spoon shaped profile makes it distinctive from its rivals this year. Many teams have dabbled with this design for years, with various guises seen from McLaren and Williams most recently. Above is the wing that the W06 ran with from FP2 onwards, whilst another much shallower wing was tested during FP1 by both drivers ahead of the Italian GP where straightline speed is even more important. The spoon shape is advantageous in a number of ways. Firstly, it reduces the overall blockage the wing creates so that immediately reduces induced drag. More downforce is produced from the centre of the wing thanks to the deeper profile and higher angle of attack, yet the wing tips are at a very low angle to oncoming flow. Reducing the angle of the wing at the tips helps reduce the size of the vortices shed from them, as the pressure difference between both sides of the endplate is significantly reduced compared to a conventional wing with a high angle of attack. Vortices are draggy so if these become smaller and more manageable, the faster the car can go. This is also why we see the rows of horizontal louvres made into the endplate – they control the pressure delta across the endplate. Another good property of the spoon shaped profile is how it interacts with the exhaust plume. Since 2014 the exhaust outlet has been moved into a central position directly beneath the rear wing, which has allowed the teams to run a higher wing angle thanks to the plume pushing on the airflow below and keeping it attached to the underside of the wing. The spoon allows this effect to continue, which will help car balance in high speed corners (which are littered around Spa). You will also note that the wing was paired with the low drag Monkey Seat winglet that was tested, but not raced, in Hungary before the summer break. This encourages the exhaust plume to work its way upwards and join with the airflow beneath the wing. The endplates were also new, with a clear emphasis on creating upwash at the rear of the car and managing rear tyre wake. Another vertical slat has joined the two existing ones at the bottom of the ‘plate, which has subsequently extended it backwards slightly. In addition, the leading edge slot has been reduced in size (lower highlighted slot in the illustration above) with another large and more extruded slot made into the ‘plate much higher up (upper highlight). These are designed to pull away turbulent air from the outside of the endplate and through the inside, before being swept up by clean air as part of the upwash effect. This further reduces the pressure difference eitherside of the endplate which makes the car more efficient in a straight line. Finally, Mercedes reverted to their test specification front wing endplates. The change was subtle and only involved moving the twisted vane to its winter position (this was a cut and paste job rather than manufacturing entirely new endplates), but it would have changed how air is pulled out from behind the front wing and around the front tyre. Oh dear. This was supposed to be the race that McLaren-Honda made a step towards the light (at the end of what looks to be an incredibly dark and long tunnel). Although I believe Honda motorsport boss Yasuhisa Arai was misquoted by saying that ‘version three’ of its power unit would be ‘as powerful as Ferrari’, there was a lot of promise surrounding the upgrade. I made my thoughts clear on Richland F1 over the weekend, so I’ll quote what I said here and expand upon my points made. “McLaren-Honda came into the second half of the season promising a higher power output from its drivetrain and with that an upturn in form. Much has been said about Honda’s disappointing upgrade – which was at the expense of three engine tokens – but in reality their lack of pace was not too surprising at Spa. Whilst Honda motorsport boss Yasuhisa Arai has insisted that their new ‘version three’ spec power unit matches Ferrari on raw power, I think a lack of context has made McLaren look worse off. The tokens were spent primarily on the internal combustion engine, with the rest on some ERS packaging and upgrade tweaks. Essentially, the tokens spent allowed Honda to replace the top of the engine, with an emphasis on improving the combustion chamber in particular. The Honda power unit is not the most efficient and uses the most fuel on the grid, so for all the power they were producing this was mitigated by the additional fuel weight in qualifying and having to tone down the engine for the race to be within the 100kg fuel weight limit come the chequered flag. Honda are confident that the changes made to the combustion chamber have upped power output, which is fair enough. However the other huge problem they have is maximising the ERS as the electrical deployment is hampered by the MGU-H’s (the MGU connected to the turbo) inability to charge the battery effectively. This was an issue Ferrari had last year and since sorting the problem they have made leaps and bounds. At a track like Spa there is a lot of full throttle and few heavy braking zones, so the MGU-K is harvesting less energy (connected to the crankshaft and harvests under braking) and the MGU-H has to be responsible for providing a lot of the electrical power. As a result of this problem, both drivers are losing chunks of laptime down the straights as the ERS is worth in excess of 160bhp. So, in other words, there is potential for the Honda power unit to be good, but I think they have heavily underestimated just how hard it is to produce a good hybrid system. If they can sort the ERS out for next year (yes, next year – it will require a bit of an overhaul I would imagine) then I see no reason why McLaren can’t return to the top. I have enough ‘inside’ knowledge to tell you that the MP4-30 is a pretty decent chassis. It’s not a Mercedes beater but it’s alongside the likes of Ferrari and Red Bull. These power unit issues are slowly being overcome, but a lot of false hope hasn’t exactly done their reputation much good – where’s their title sponsor? Sauber have finally got their hands on Ferrari’s 2015 power unit, which boasts a much improved energy recovery system and slightly more power from the ICE. Their Friday form looked very promising although this pace turned out to be no more than a flash in the pan as they faded away throughout the remainder of the weekend. The problem for Sauber is that they do not have the funds to maintain chassis development. 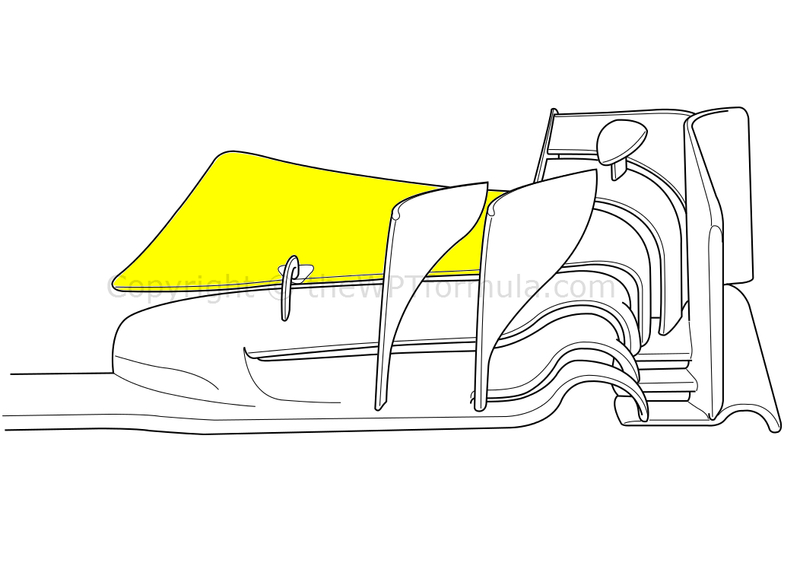 The last major change I recall was a new front wing in China, which has been used sparingly since its introduction. They need money fast, or even McLaren might catch them in the standings! Speaking of Ferrari power, the Prancing Horse had a bit of an overhaul for Spa featuring a combination of old, new and revised components all over the car. The SF15-T ran with the pre-Spain sidepods all weekend (without the radical step along the side), so clearly these produced less drag than the Barcelona upgrade. These were coupled to a new rear wing design, which, unlike Mercedes, featured a low drag profile utilising a straight leading edge. The endplates were modified to suit, rather than totally swapped out for new ones. It was the front wing area that caught my eye the most. Traditionally Ferrari always produce a low drag front wing design around this time of year, anyway, but this was more different than its most recent efforts. We don’t tend to see low drag front wings anymore because the wing is so important to how the rest of the car’s aerodynamics behave. Wing angle is often reduced but most teams would rather keep the existing aero paths that set up the rest of the car and look for other ways of reducing drag. Ferrari have, ever since the latest technical regulations (2009), always looked for ways to improve the aero efficiency of the front wing at high speed tracks. But this wing is unlike its previous attempts at finding a good tradeoff as only a few changes have been made. The main elements of the wing remain unchanged since the previous round: the main plane and extremely sensitive outboard elements are identical. 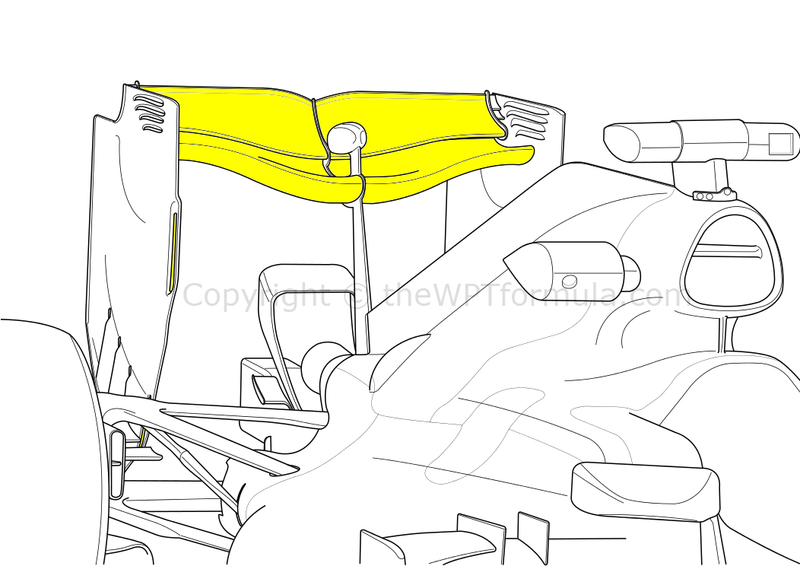 The upper flap (highlighted) and cascade components have been switched to totally new setups in a bid to reduce drag yet retain the core aero structures of the car. The new flap is now one element in trapezoidal form, with a large point made at the inboard section before dramatically slimming in size as it spans outwards. This is done to provide control to the Y250 vortex that is shed directly beneath the flap by the main plane’s underside. Its an elegant design which shouldn’t cost them too much downforce whilst boosting top speed. Onto the cascades, and gone is the main winglet. In its place is another r-vane to accompany the already-existing one, which set up vortices to turn airflow around the front tyre. Removing the winglet will reduce induced drag caused by the large blockage, with the vane providing more than enough manipulation to oncoming high-speed flow to achieve virtually the same job as the winglet did. 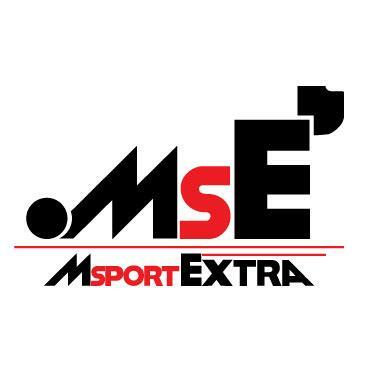 This entry was posted in 2015 Highlights, Technical Highlights and tagged 2015, analysis, Belgium, downforce, engine, f1, ferrari, front wing, gp, highlights, lotus, low, mclaren, mercedes, power unit, rear wing, sauber, tech, thewptformula, tokens, updates on August 27, 2015 by thewptformula.